Split black gram dal is a very nutritious pulse. Soak some, grind with spices, and fry, and you get the versatile Uluttam Vadai! Besides being the perfect accompaniment with idli, for an ideal breakfast combination, this vadai makes a tasty dish in a variety of avatars! Vadai Curry is prepared by immersing the cut pieces of crisp hot vadais in hot and spicy sambar. For the exotic Thair Vadai, dip the vadais in warm water, gently squeeze out the oil, and immerse in seasoned curd. Rasa Vadas are hot vadais soaked in flavourful rasam, and lighter on the stomach than the Sambhar or Vadai Curry! The best Vadais we have tasted so far are the ones distributed at the Hanuman temple on Saturdays. The fact that the vadais had adorned Lord Hanuman as a garland along with the tulasi (basil) garland lends it a divine flavour. Whenever we visited our village, Rukmini prepared the most exotic vadais. That is the magic of this dish. Whenever and wherever you happen to relish it, it seems to be THE best. To prepare the delicious Rukmini Vadais (as we have named it) we can follow the given recipe. 1. Wash and soak black gram dal for half an hour. 2. Cut onions very finely into thin thread like slivers. 3. Drain the dal. Add ginger and salt, and grind coarsely without water. 4. Sprinkle very little water if the dal mixture sticks to the jar. 6. Add onion slivers, curry leaves and crushed pepper and mix well. 8. Dip your hands in water, and the take a lemon size ball of the dough, and pat it into a thick vadai. 9. Make a hole in the center using your finger. 10. Gently slide the vadai into the hot oil. 11. 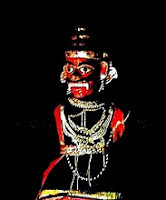 The vadais can also be patted to shape on a banana leaf or a sheet of plastic. 12. 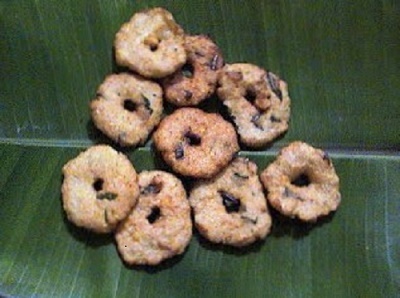 Fry the vadais in batches of four or six, till golden brown in colour. This vadai will be slightly crisp and firm on the outside and soft inside, as shown in the picture. Relish vadais as they are, or with a chutney dip, or make any of the variations with sambhar, rasam and curd! A Note from Dibs: Although a relatively easy dish, there are huge variations in the texture of the vadais. There are two important factors in vadai making. One is the consistency and texture of batter, and the second is oil temperature for frying. I don’t like to add soda and so on to any of my cooking. It is my experience that, how firm or soft a vadai is, depends on the amount of water used in grinding, as well as how smooth or coarse the batter is. Half an hour of soaking is sufficient for soft vadais, when the climate is not too cold! I have found soaking the dal for longer duration produces rubbery vadais. A smoother batter with more water gives a softer and spongy texture. Very little water, and coarse batter like Rukmini vadais above, give a nice firm texture. As with any deep frying, the temperature of oil should be closely monitored. If the oil is not hot enough, the vadai will eventually cook, but will result in a very oily and soggy vadai. If its too hot, the outside will quickly burn, leaving the insides uncooked. 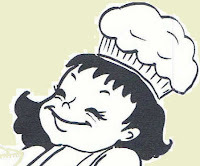 A best practice is to test, by dropping a spec of batter in the oil. If it rises immediately to the surface, and not burnt, the temperature is right. If oil is not hot enough the batter will sink and rest at the bottom. If its too hot, oil will smoke, and batter drop will be burnt in no time! This post goes to My Legume Love Affair event started by Susan of 'The Well Seasoned Cook', and hosted this time by Sra of 'When my Soup Came Alive' ! Even I add onions to uddinavade and we like vade like that. Good tips also dear..
That is so good! I somehow end up with runny batter everytime I make them, I then spoon them into the oil. The hole is just impossible! mmm. looks so delicious. Thanks for the nice tips. divya - yes! while grinding in a mixie, if there isn't enough water, the mixie becomes hot! hole or not the vadai tastes great! looks yummy .. wud love to have it right now ..
Usha - Thanks, and see Yosee's trick! Dibs, this post reminded me of the two curd vadas that are sitting in the fridge - will have one for lunch now, yumm! Thanks for the entry - did you mail it to the right ID - srablogATgmailDOTcom ? Please try again.